The vampire protagonists of horror-mockumentary "What We Do in the Shadows" may seem like creatures of habit, but they're really just slow. While one vamp uses a modern convenience like eBay to "do my dark bidding," the rest rely exclusively on their limited intelligence and human servants. So it's only fitting that they've only recently become the subjects of a "Real World"-style reality show documentary. The leading men of "What We Do in the Shadows" are definitely not of this era: they're walking, heavily-accented, frilly-blouse-wearing corpses and that's the source of a lot of energetic, expertly-timed gags. Like their characters, New Zealand co-writers/directors/stars Jemaine Clement and Taika Waititi have their seemingly-improvised routines down cold. As a result, "What We Do in the Shadows" is an irrepressibly charming B-movie that never over-stays its welcome, and is both conceptually clever and admirably well-executed. 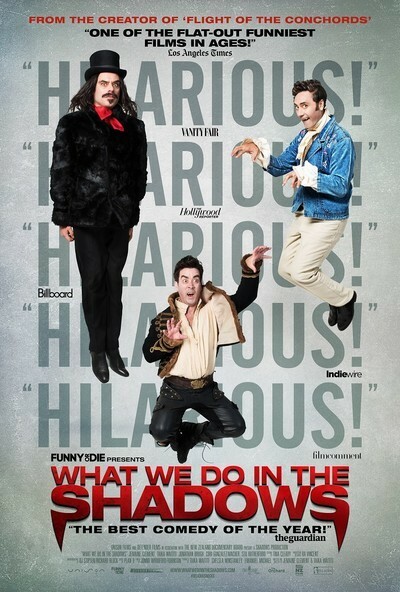 Case in point: "What We Do in the Shadows" immediately scores several belly laughs during its first scene. After sundown, Viago (Waititi) calls his three eccentric roommates together to talk about house chores. Frustrated womanizer Vladislav (Clement), whose facial hair and fur coats make him look suspiciously like Australian rocker Nick Cave, mostly keeps to himself. But young rebel Deacon (Jonathan Brugh)—he's not even 200 years old—hasn't done the dishes in five years, while millennium-old Petyr (Ben Fransham), a bucktoothed distant cousin of Max Schreck in "Nosferatu," can't be bothered to clean up the human remains that litter his corner of the apartment. Viago's group is pretty set in their ways, until they prey on and turn Nick (Cori Gonzalez- Macuer), a schlubby working-class guy who looks like a wannabe soccer hooligan, into a vampire. The addition of Nick to the group's ranks predictably has a big impact on the vampires' after-lives: for starters, Nick helps his inhumanly old friends to sneak into night clubs that they were previously not allowed to enter. That last joke perfectly encapsulates the best qualities of "What We Do in the Shadows." Watching Viago and his buddies try to get into various clubs is an inherently clever twist on a familiar vampire trope: blood-suckers can't enter anywhere they're not invited into. But watching the group's frustrated attempts at breezing past several unkind bouncers in a brisk, perfectly-paced montage sequence makes an already-funny joke even funnier. You can hear Clement's Vladislav protesting in the background while Waititi's Viago skittishly explains through voiceover narration why his friends always wind up at "the hottest vampire night club" (ie: it's always empty). In this brief gag, you can see that "What We Do in the Shadows" is a real ensemble comedy instead of a glorified star vehicle for Clement ("Flight of the Conchords," "Men in Black III"), the most famous of the film's minor league stars. The only exception to this rule is Gonzalez-Macuer, who doesn't get much to do given his character's minor role as an outsider/catalyst. Gonzalez-Macuer does at least stand out during an uproariously gross projectile-blood-vomiting scene, a slapstick-y throw-away gag that he performs with consummate gusto. Clement is predictably great as a sulking brute, but Brugh and Waititi are the film's standout performances. Waititi's nervous nice-guy schtick brings Andy Kaufman's Latka character from "Taxi" to mind, especially during the scene where Viago genially chats up a college-aged victim while putting newspaper underneath her feet (all the better to prevent blood stains with). And Brugh delivers one of the movie's biggest laughs when he rambles to Nick about the inhuman condition of being a vampire, and eventually reveals that he once made "the simple mistake of fashioning a mask out of crackers, and being attacked by ducks and geese and swans." Brugh's sullen, dead-pan line-delivery is priceless as is Gonzalez-Macuer's impassive response. It would be very easy to take for granted what the creators of "What We Do in the Shadows" get right. Many scenes feel like master-classes in cringe comedy, like the above-mentioned blood-barf scene. And the group's chemistry really can't be overstated. This is especially true of scenes where Viago and the gang literally take flight while hissing at each other, like airborne feral cats. You've got to give it up for comedians who are this good at translating their apparent behind-the-scenes joy (watch the scene where they chase Gonzalez-Macuer around the house "Scooby Doo"-style, and tell me they're not having a blast) into a tight hang-out comedy. It may seem like there's nothing to "What We Do in the Shadows," but it takes a lot of skill to be this silly.